Charles Mingus Nina Simone Oscar Brown Jr.
With an appealing mix of sly lyrics, modern but accessible instrumental compositions and empathic group interplay, Washington DC's Greater U Street Jazz Collective and its cast of characters take you on a journey that both educates and entertains. 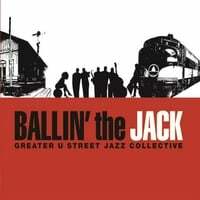 I hope you will be as surprised as I was when you drop your needle into the grooves of the GREATER U STREET JAZZ COLLECTIVE’s (GUSJC) debut recording. Ballin’ the Jack is a fun recording, exuberant in its presentation and programmatic in design. It pays homage to the motley family of Jazz, from railroad Blues, Tin Pan Alley tunes, and Ellingtonia to the mastery of moderns like Charlie Parker, Charles Mingus and Wayne Shorter. Lest today’s listeners be forgetful or uninformed, Ballin’ the Jack connects this great lineage of music to the very streets and venues, humble and glamorous, in which “The Great American Song Book” of life was nurtured and out of which it grew and continues to flower. Vitally important: Ballin’ The Jack is a collectively produced, artist-centric project. There are no third parties between this COLLECTIVE and you. This is their unvarnished, uncensored, unfiltered and un-dumbed down story. It is, as WPFW’s Ellen Carter notes, “…a creative mix of music and words that tells the story of American music…entertains as well as educates.” Edutainment is one of those concoctions that I have always considered dunderheaded: not smart enough to really educate; not playful enough to be truly entertaining; and not enough of either delectable to be truly fulfilling. The GUSJC musical recipe, however, works; time-travelling the listener from yesteryear’s U St. landmarks to the hip jazz bistros of today. While Ballin’ The Jack is by no means a parochial project, it does speak to particular social and cultural concerns that the COLLECTIVE holds dear. Only 10 years or so ago, DC was commonly referred to as a Chocolate City. The gentrification of DC is bringing about profound changes. The revitalization of Washington’s Shaw community--and especially of what can be referred to as greater U Street – reflects these changes and their rapid pace. The marginalization of this historic community and its cultural legacy is of paramount concern to the COLLECTIVE. From the time of Duke Ellington’s birth to the riots following the assassination of Dr. Martin Luther King in 1968, U St. was the center, real and symbolic, of African-American social, cultural and economic life. That is why U St. was known amongst its denizens as Black Broadway and why clever promoters punned the promenade as You St.
Of course, these fondly remembered times were also the good ole segregated days of Washington. Whites could come uptown to the Howard, to the Crystal Caverns and the Lincoln Colonnade. Blacks were not generally welcomed downtown or were severely constricted in their public accommodations and rights. Therein lies the rub: that so much we celebrate about the city and its culture occurred under such despicable circumstances. The process of negotiating the transition from a segregated city to a truly open community has been, and continues to be, complicated and fraught with challenges. The narrative of this project is ingeniously rendered. Its compositions explore the Collective’s concerns with wit, with lyrical and musical craft, with respect for the mosaic of American music and the primary role that black vernacular styles have had in its elaboration. Ballin’ The Jack is a bold project, not because it is confrontational, but because it insinuates the facts of the matter so infectiously. The GUSJC is a working band. A working band and a collective aren’t always synonymous. The collectivity of this ensemble is rooted in common understanding and purpose, and yet embraces a diversity of musical temperament and inclination. You will hear strong and distinct personalities. You will also hear a balance amongst personal and ensemble expression that is only possible through musical understandings reached in repeated live performance. You will surely appreciate the versatility of this band. With the exception of “Ballin’ The Jack,” all of the music you will hear is original. Thomas View contributes the lion’s share of the writing. View has a big bass sound and a penchant for irreverent lyrics. Art Cobb is a well-schooled drummer, deftly framing the arrangements, keeping impeccable time and swinging tastefully. Compositions by Russell Carter and Pete Frassrand will whet your appetite for more. Carl McIntyre’s soloing is a pleasant revelation. The notes credit a number of collaborators. Each adds a particular musical gesture to the identity of the story they have been enlisted to tell. The same must be said of the cast of storytellers and vocalists on the project. Each brings a specific nuance, or character, to his or her moment. Indeed, pieces like “The Style Section” and “The Angry Clown” are like mini-radio plays, bubbling with a mix of wacky characters and their existential preoccupations. In 1915, a now forgotten, black songwriter named Chris Smith wrote “Ballin’ The Jack.” Like W.C. Handy’s “St. Louis Blues” and James P. Johnson’s “Charleston,” Smith’s song derived from black folklore, music and dance. The jack was a tool used for railroad repair. Railroad repair was hard work, dirty work, the kind of work to which many black men were consigned in the post civil war days and beyond. As the Blues and railroading were parallel developments, the lore and imagery of railroading became an important part of the poetry and instrumental vocabulary of Blues and ultimately Jazz. In those, good ole days, the identity of black men was tied to their low occupational station. Thus bootblacks became known as Boots and railroad lineman became known as Jacks. Boots and Jacks became slang references for black men. When Jacks came to town, they had pockets full of money. I’ll leave it to your imagination to figure out the original meaning of “Ballin’ The Jack” and how all of that became the basis of a social dance. Like the “The Charleston,” “The Black Bottom,” and the “Twerk” of today, “Ballin’ The Jack” eventually crossed over. Judy Garland and Gene Kelly introduced a sanitized version of the dance, to broader society, in the 1942 movie musical, For Me and My Gal. To trace the story of “Ballin’ The Jack” is to follow a familiar path of cultural appropriation. In re-versioning “Ballin’ The Jack,” GUSJC is symbolically rescuing and reclaiming a cultural touchstone from the margins of nostalgia. GUSJC’s update reminds us how rich the culture is and what a powerful and renewable resource that it is. 2013 is not too late, all we gotta do is board the train that follows the river running west and ball the jack.